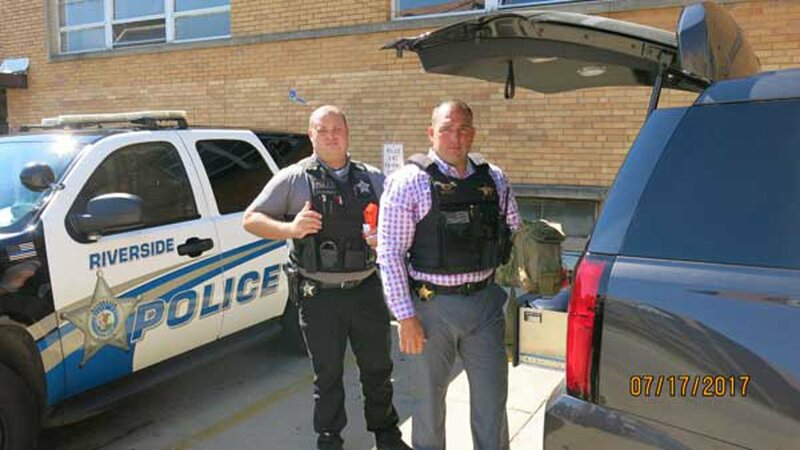 BRIDGEVIEW, Ill. (WLS) -- Two detectives from west suburban Riverside were praised for jumping into action to help a motorcyclist injured in a crash last Friday morning. Only later did they realize they were helped save the life of an off-duty officer. Detective Sergeant Leo Kotor and Detective James Lazansky were taking a prisoner from south suburban Evergreen Park to Riverside when they saw a BMW hit a motorcycle at West 73rd Place and Harlem Avenue in southwest suburban Bridgeview, police said. The biker landed on the street and appeared to have severe injuries, police said. The detectives called 911, stopped their unmarked car, activated their emergency lights and blocked traffic to allow emergency crews to respond. Then the detectives got medical supplies out of their trunk to help the motorcyclist, who appeared to have back injuries, a large deformation on the front of his head and a hole where his bone was protruding from his right arm. They applied a tourniquet to his arm and witnesses helped them apply bandages to the back of his head, which was bleeding profusely, police said. Then Kotor and Lazansky saw the man had a police I.D. and a weapon on him, identifying him as a Cook County sheriff's officer. When an ambulance arrived, they turned over care to paramedics. Riverside police did not release any more information about the BMW or its driver.